Something strange in the neighbourhood? Who you gonna call? Well…we’re calling you! This Halloween, we’ve teamed up with Sony Pictures to give wannabe ghost hunters a once in a lifetime ride in the iconic Ghostbusters car, the Ecto-1. All you need to do is head here to enter for your chance to win a legendary Ecto-1 spin this October 29th! Available for one supernatural day only, we’re giving Londoners a spooktacular ride along in the legendary car to some of London’s biggest and scariest Halloween events at attractions including the London Dungeon, Madame Tussauds, and the Coca-Cola London Eye. Or just take the Ecto-1 for a spin around London. The competition celebrates the forthcoming release of Ghostbusters which will be available to own on Digital on 7th November and on Blu-ray™ and DVD on 21st November. 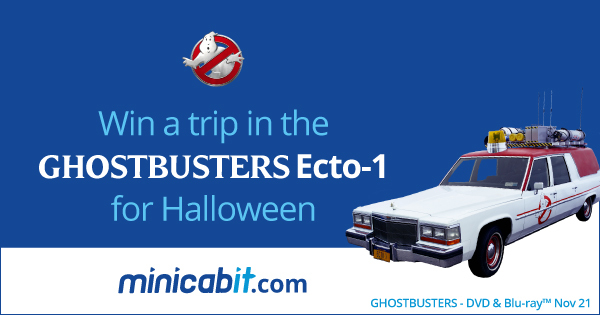 If you ain’t afraid of no ghosts, then grab your proton packs and visit www.minicabit.com/ghostbusters to enter for your chance to win your free trip for Saturday 29th October. Rides will take place between 10am and 6pm and full T&Cs can be found here. Live out all your childhood dreams in style this Saturday and become a Ghostbuster for the day.